Enjoy a day on the beach, with palapas, beach activities, two bars, a snack bar, a swimming pool and a restaurant! A great way to spend the day in Mazatlan, just relaxing on the beach or at the oceanside bar! The best news is that unlike any cruise sponsored excursions, it's FREE*! 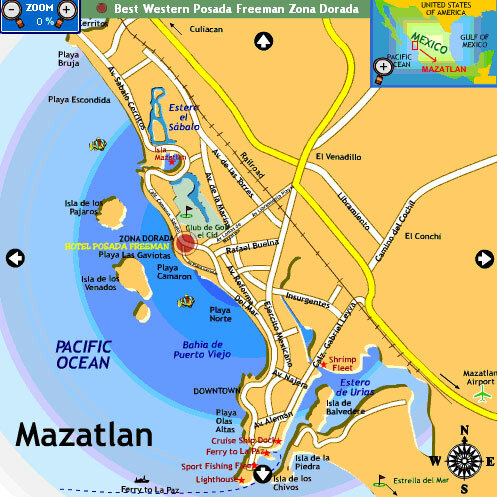 We offer the facilities of the Brand New Hotel Posada Freeman Zona Dorada, in the heart of the Golden Zone, on the beach, to you FREE of charge with any scuba diving, hobie cat, amphibian or water sports reservation! In fact, all of our watersports are conveniently located right in front of the hotel, so you can relax AND have fun in the water! Free access to all hotel facilities, including beach, pool, restaurants, bars, and more! Brand New Hotel in the heart of Mazatlan's Golden Zone, between the Inn at Mazatlan and El Cid! Enjoy a cocktail at La Palapa, the ocean view bar, after a morning of fun beach activities! Enjoy breakfast or lunch at the on-site restaurant, Los Duraznos, or at it's nice cocktail lounge! Swim in the outdoor pool or relax in palapas on the beach in between Jet Skiing and Hobie Sailing! Cruise Passengers: Yes! This tour is available to you for a cruise shore excursion. Pick the most convenient schedule for you! Duration: You can stay as long as you like. Requires: A reservation of any tour or activity that we offer. Don't Forget: Biodegradable Sunblock, Hat, Camera, Swimsuit, Money for drinks and food, Your Ticket. * Use of the facilites and beach at the brand new Hotel Posada Freeman Zona Dorada is FREE with the purchase of any tour or watersports activity we offer. What a deal! What a great deal! Not only do you get to enjoy our wide selection of beach activities at discounted prices, and get a FREE Mazatlan Fun Discount Card, but you can also relax and lounge at the hotel and beach club, enjoying the restaurant, bar, pool, and beach facilities to your heart's content. * There are two Posada Freeman Hotels. One is downtown on Las Olas Beach, built in 1944. This one is brand new, and is between the El Cid Castilla and Inn at Mazatlan Hotels.